Andrew Gilbert is not afraid of a challenge. At the young age of 23, he launched Node4, a startup that is now a leader in cloud computing. And that same entrepreneurial attitude drove him to tackle his lifelong dream of learning to fly. A free schedule is a great excuse to start working towards a private pilot’s license, but Andrew needed just a bit more motivation. That motivation turned out to be taking delivery and being able to train in his first Cirrus SR22 at The Flight Academy, a Cirrus Certified Training Center located in Seattle, Washington. After all, there’s nothing like wanting to solo your brand-new plane to spur your training along. Not unlike his cloud computing business, Andy chose a seriously fast path to getting his pilot’s license. He traveled from the U.K. to Seattle and committed to an intense training schedule of 6 days a week, for 6 weeks straight. Andrew’s training ground was Boeing Field – an international airport in Seattle and home to airliners and loads of air traffic. In Andrew’s words, it was “a proper flying experience”. Stressful at times, but also realistic and challenging. And it more than prepared him for his first solo flight – 200 nautical miles of crisp blue February skies to a rural airport on the west coast. It was surreal. It was exhilarating. It was addicting, and Andrew hasn’t turned back since. Andrew completed his training in 2016 and he hasn’t stopped since. He upgraded to an SR Series G6 in 2017 and is quickly approaching delivery of his much-anticipated Vision Jet this summer. No stranger to flying in the United States, he took delivery of his second Cirrus aircraft at the company’s Vision Center in Knoxville, Tennessee, where Andrew confirmed they take “very good care of you”. “Freedom” is the word Andrew uses to describe how flying has changed his life. He travels more and makes it home in time for dinner. He takes his family on more adventures. And he connects with his young sons through flying. Idling along is certainly not Andrew’s modus operandi. 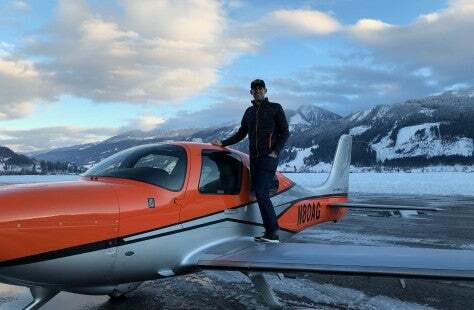 He plans to pilot his own Vision Jet, an ambitious plan that would definitely make the folks at Cirrus proud. As the world’s first single-engine Personal Jet, the Vision Jet was designed to do exactly that – be flown by the owner and pilot. Andrew’s central location in the U.K. has allowed him to fly across the snowy mountains of the Swiss Alps and the azure waters of Southern France. So, it’s only fitting that his bucket-list Vision Jet trip is to the (slightly less tranquil) desert of Las Vegas, Nevada. Here’s to hoping that gamble has as much of a pay-off as those intense weeks of training for the first time in his Cirrus.